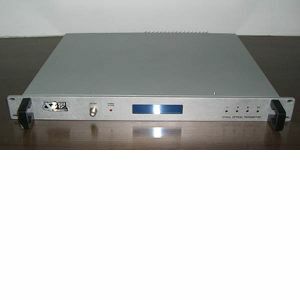 CYT1310nm optical transmitter is small in size and compact structure in rack. Combined with CYS03 module, we can make an excellent performance HFC headend platform and the transmitter can be widely used in Metro HFC Network system. With aid of the techniques of microprocessor and inner bus structure, CYT1310nm optical transmitter adepts DFB laser diode and provide high performance, wide working bandwidth, high capacity for transmission and low non-linear distortion. The embedded processor monitors the status of DFB laser diode and feedback the data of the diode to the controller of CYS03 platform. The intelligent controller makes CYS03 module work in a stable and reliable environment. CYS03 module has the Predstrotion Circuit to improve CSO and CTB performance. Two types of module are available, Automatic Gain Control(AGC) and Manual Gain Control(MGC). And All of the parameter can be configed by front panel. 1. The insert module design especially for the CYS optical transmission platform. 2. All band predistortion circuit. 4. Consummate temperature controlling circuit.